I’ve been teasing instagram viewers with shots of this quilt in progress for weeks — maybe months — but it’s finally done. 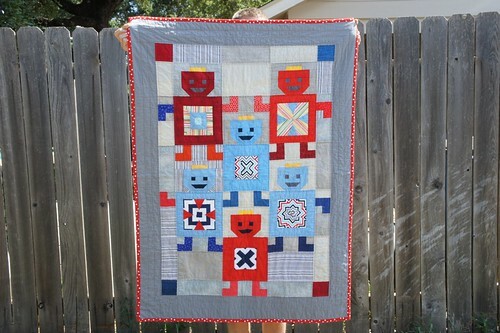 A quilt for my favorite little guy. I’m not sure what inspired the robot theme. It was so long ago that I dreamt this pattern up. I thought about it for weeks before I got up the nerve to draw it out in Illustrator, then I waited even more weeks before I actually started piecing it. The whole top is paper pieced. I was worried about that at first. I was thinking there would be too many seams, too many tiny pieces, but it seems to have worked out just fine. I started with quite the collection of reds, blues and grays. 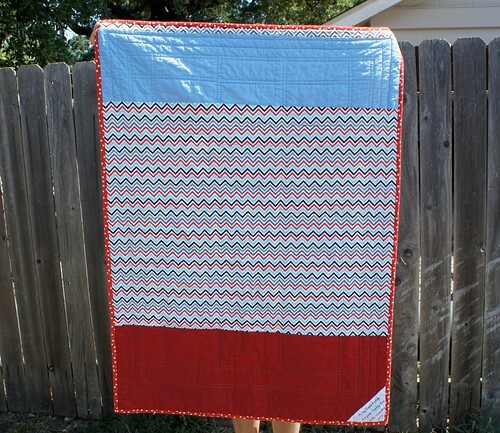 Then threw in that Remix zig zag print and another stripe at the last second. 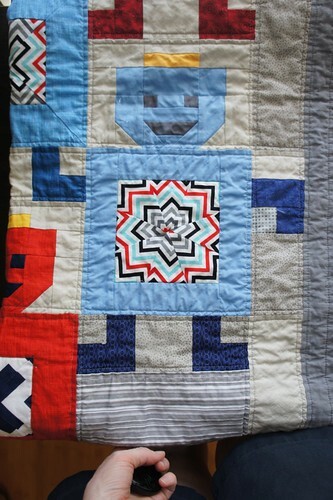 Originally I’d considered doing the whole quilt in solids. I sort of wish I’d gone with that. 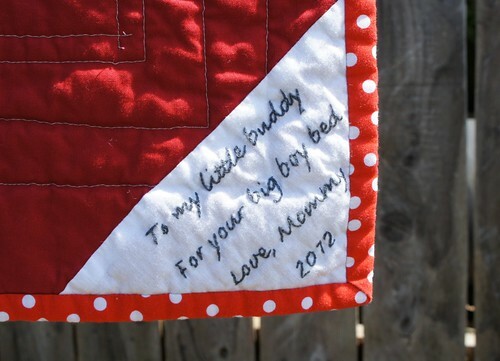 The whole top is very very busy… Just like it’s new owner (“I buzzy momma!”). The back and binding were a bit of a challenge. After I’d put the border on the top, I was about 2 inches short on the backing. 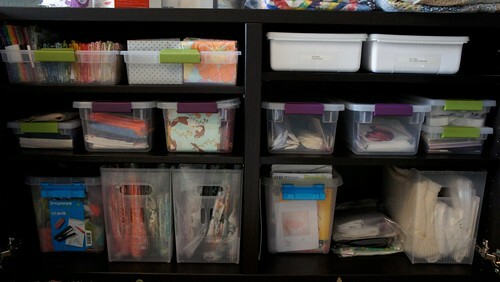 And the amount of fabric I had left from the top was seriously about 6 2 inch strips in various fabrics and lengths and that big piece of Remix. Finally I scrounged up enough of the remix to squeak out the needed length. Poor Chris and Alex offered about a million suggestions, none of which I took. I also solicited help in choosing the binding on instagram, twitter, and facebook. But guess what? I didn’t take any of those suggestions either and ordered this red polka dot and another multicolor dot from the Remix collection. Obviously I picked the red, but I’m not sure I really like it. I think it’s really very Christmassy. On the other hand, the other dot was just a bit too much for the eye. I’m really loving doing these quilt labels with the embroidery. It’s such a change of pace after piecing a quilt to sit on the couch with some trash tv show on (ahem anything on HGTV), and stitch away. I wonder if Sean will sleep with the label by his face the way Alex does with her quilt. 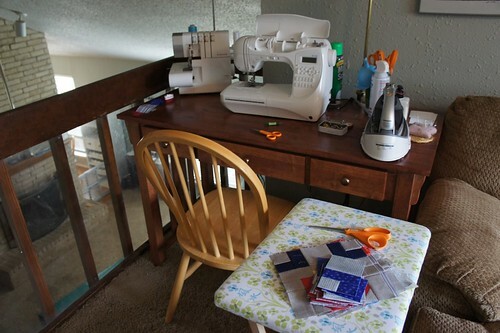 PS — wow, my quilting stitches look awful in that picture! I swear they are way straighter and more even than that in person… Really. wink wink. It’s a sickness, I know. When Heather Ross posted her mermaids for sale on Spoonflower* I had to have some even more so I ordered a yard. But in all my excitement I didn’t notice that the default fabric was the cotton silk blend, so when this gorgeous silky fabric arrived in my mailbox, I couldn’t help but feel a bit let down. What was I going to do with this type of material that was so suited to a formal dress?… especially since I only had a single yard. And then, I realized that Alexis needed a new formal dress for our cruise vacation that was coming up. After I’d drafted the pattern and made the trial dress, I was still afraid to cut into the fabric. I agonized for days about how to lay the front and back on the fabric so as to maximize it’s usage. The layout where the pieces fit best also had the unfortunate side effect of making the direction of the print “upside down” on the back. There were other possibilities, but they involved piecing the back together and it would have required making the skirt less full. In the end, I decided to go with the upside down layout and figured that probably no one but me would even notice. Actually, I don’t even notice. After a lot of debate with myself and Alexis (have you noticed I have a decision making problem? ), I decided to go with a double strap over each shoulder. I’m so glad I did. I think it just adds the perfect amount of detail to the back of an otherwise very simple dress. So there you have it. My very first go at actual pattern making for clothing. Don’t get me wrong, I’ve made dresses without a pattern before, but there was no shape to them (think jumper style over the shoulder A-line toddler dresses) and I didn’t really make the pattern. I have to say, this was such a success and so. much. fun. that I’ll definitely give it another go someday! P.S. The cruise was fabulous! * I should probably mention that these Swimming Sisters are also not of the same size as the Mendocino prints, OR of the previous Spoonflower offerings. There’s a picture of the different scales of this print on flickr. The scale of this fabric is in the middle. 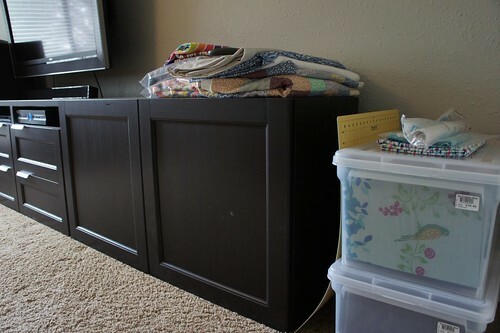 Remember I told you that I had another project keeping me from the quilt for the boy? 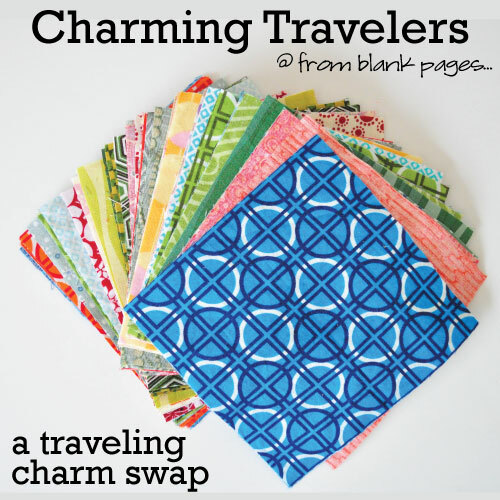 I’m so excited to tell you that today Sew,Mama,Sew! 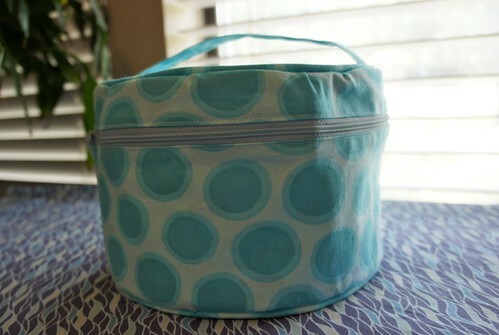 has posted a tutorial I wrote for this Round Travel Bag. It’s based on a bag I had when I was in college (and we won’t talk about how long ago that was!) and is really the most functional little toiletry bag I ever owned. I hope you enjoy it!